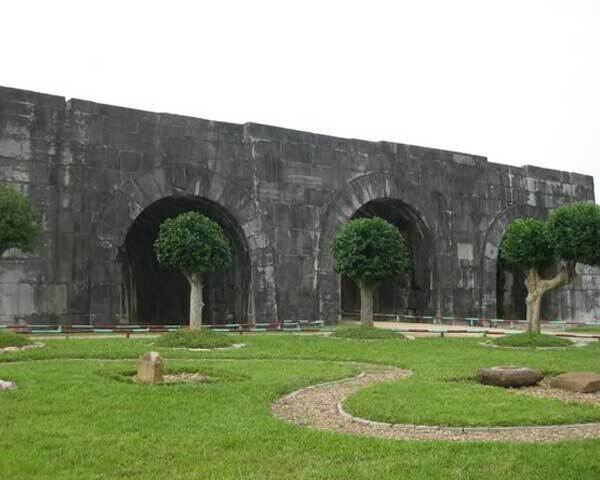 The citadel of the Ho Dynasty was built in 1397 by Ho Quy Ly who was the highest-ranking mandarin of the Tran Dynasty at the time. 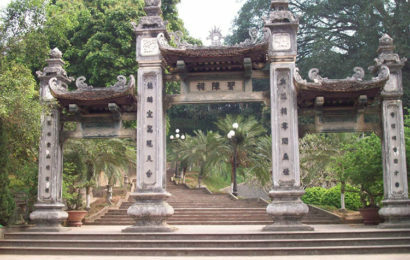 After the citadel was completed, Ho Quy Ly forced King Tran Thuan Tong to move the capital from the citadel of Thang Long (Ha Noi) to Thanh Hoa. 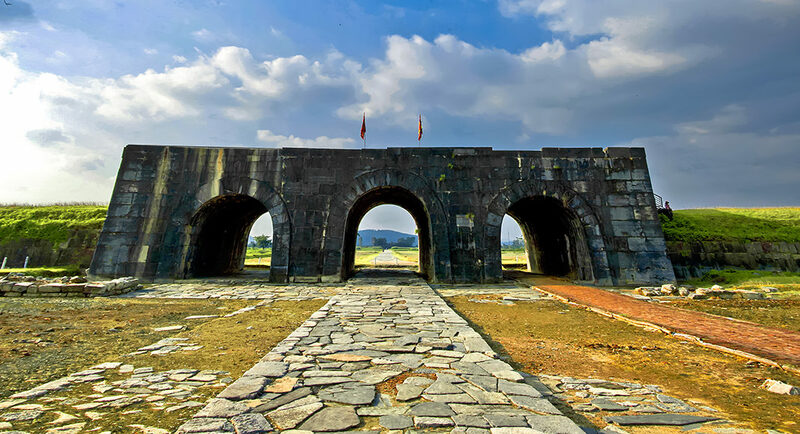 In the second month of the year of Dragon (1400), after coming to the crown to replace the King Tran, Ho Quy Ly renamed the country Dai Ngu (1400-1407), the citadel of the Ho Dynasty officially became the capital citadel. The citadel of the Ho Dynasty is also known as names of An Ton, Tay Do, Tay Kinh, Tay Nhai,Tay Giai. The citadel — built in three months and slotted together without any mortar — is an impressive feat of 15th-century engineering. 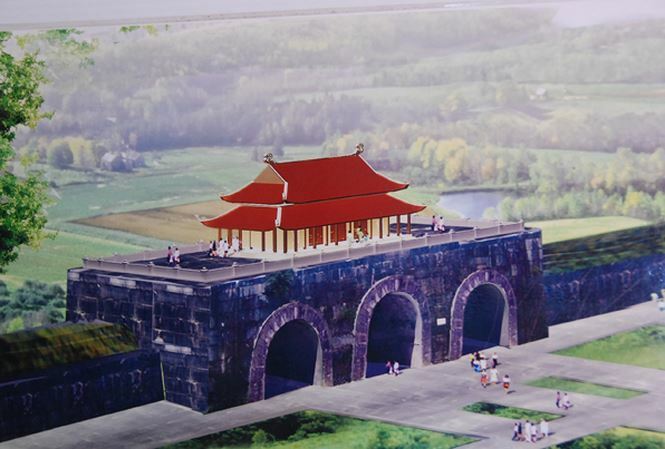 I contact a friend, Xuan, who lives in Ninh Binh, about 60 kilometers east of the citadel. We arrive at the north gate of the Ho Citadel, pay the 10,000-dong (about 50 cents) entrance fee and scramble up the grassy banks to take in the panorama from the top of the wall. 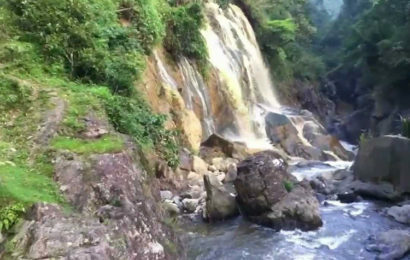 Xuan tells me the location was chosen according to the principles of feng shui, pointing out the Don Son and Tuong Son mountain ranges that protect the valley, and the Ma and Buoi Rivers that flow on either side of the citadel. 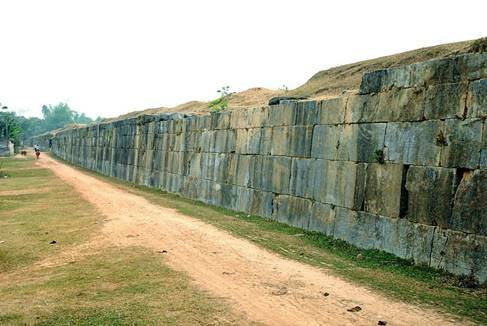 Despite the bucolic view, my attention is drawn to the massive blocks of stone in the wall. They’re slotted together without any mortar; some measure several cubic meters. These 600-year-old walls, which stretch almost a kilometer on each side, are remarkably intact, and the four vaulted gateways stand as sturdy as ever. Inevitably, parts of the wall have subsided or become overgrown with grass and shrubs, but that somehow adds to the site’s mystique. Encompassed within the walls is a timeless scene of corn and rice fields, ponds and dirt tracks — a picture of abundance and self-sufficiency. “So how come the Ho Dynasty was so short-lived?” I ask Xuan about this lesser known page of Vietnamese history. In the late 14th century, he explains, the Tran Dynasty was in disarray, and Ho Quy Ly (aka Le Quy Ly), a regent in the court of Emperor Tran Thuan Tong in Thang Long (Hanoi), laid plans to usurp the throne. In 1397, he had this new citadel built, a task that apparently took only three months — an amazing feat of engineering in an age before power tools. 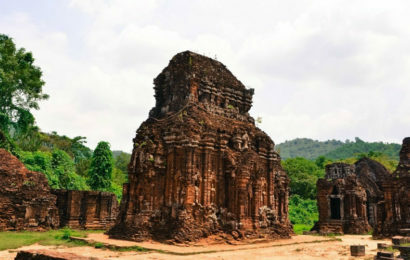 When Ho invited the emperor to inspect the newly built citadel, initially known as Tay Do (“Western Capital”), he imprisoned then executed Tran Thuan Tong, establishing himself in 1400 as first emperor of the Ho Dynasty. After ruling for just a year, Ho Quy Ly relinquished the throne to his second son, Ho Han Thuong, who reigned for a mere six years, after which the Ho were overrun by the Ming from China. Despite his brief tenure in Vietnam’s top job, Ho Quy Ly was responsible for the introduction of paper money and limits on land ownership, as well as opening ports to foreign trade and expanding the education curriculum to include subjects like mathematics and agriculture. We drive along the dirt road through the empty citadel toward the south gate, the citadel’s main entrance, which is pierced by three arches, compared to just one in the north, east and west walls. 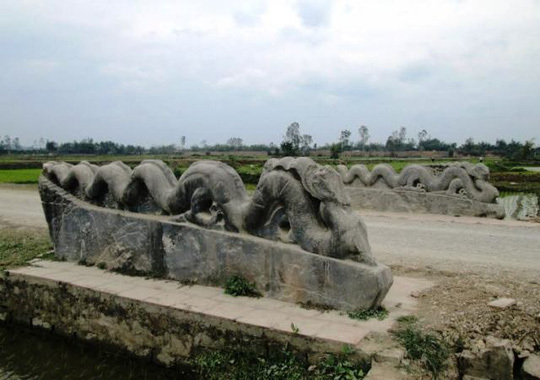 We step into a bamboo hut outside the south gate where the walls are lined with illustrations of elephants and horses dragging huge slabs of stone from a quarry, bamboo rafts carrying the slabs downriver and men and beasts hauling the finely cut stones into place on the wall. From the bamboo hut we stroll into an almost empty museum where a few artifacts such as stone balls for use with slingshots and a terracotta phoenix head have been recovered from the site. 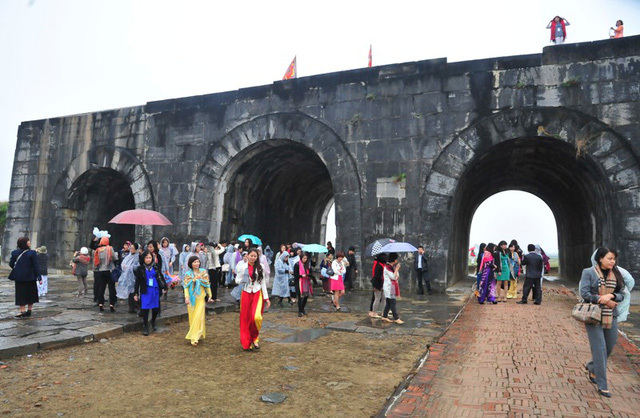 As citadel of Ho dynasty, you can come to see Hue Imperial City. Developing tourism may mean banning farming activities at the site and thus affecting local livelihoods. I leave Xuan chatting to the curator and clamber up on top of the south gate, where I imagine the empty citadel bustling with its 15th-century inhabitants as they throng the markets, palaces and temples that once stood within these impenetrable walls. Snapping back into the present, all I see is a file of school kids cycling through the rice paddies on their way home from school. Xuan comes out of the museum, and tells me of the curator’s concern for the future of the citadel. 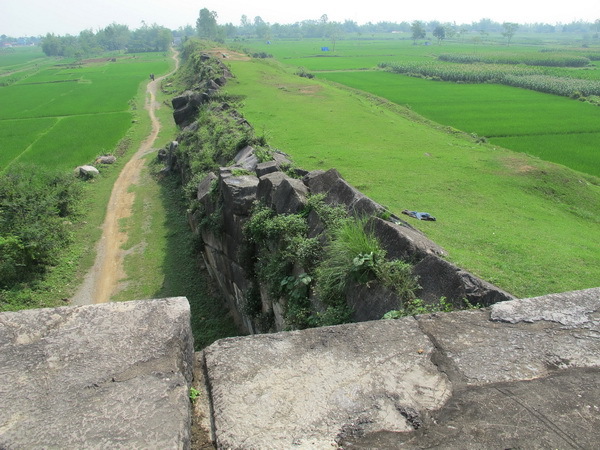 As part of the deal with UNESCO, Vietnam is committed to protecting the citadel’s heritage, which means preventing any new building from spoiling the view, and terminating agricultural production, such as rice farming, inside the citadel. He also explained that plowing, raking and digging irrigation ditches within the citadel has exposed archaeological relics and has a negative impact on the underground architecture at the site. At present, it looks like local farmers will have to sacrifice their land rights if their country’s leaders are determined to develop the citadel as a tourist attraction.